Modulight ML7710-PDT laser platform CB testing completed - Modulight, Inc. Modulight ML7710-PDT laser platform CB testing completed - Modulight, Inc.
Tampere, Finland, September 09, 2014 – Modulight, Inc., an ISO13485 certified laser manufacturer based in Tampere, Finland and San Jose CA, announced today a landmark in medical laser technology. 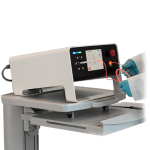 For the first time medical companies can purchase a multi-wavelength turnkey laser system with all design and hardware documentation ready for CE certification or FDA approval through PMA or 510(k) process. The CB certified laser system is also offered as a private label turnkey solution with a possibility for customized treatment protocols. ML7710-PDT laser enables literally hundreds of configuration possibilities with different wavelengths (400 – 2000nm), number of channels (up to 8 channels) and variable output power (up to 15W visible) depending on customer needs. The laser system supports both multi-channel single-wavelength applications and multi-wavelength clinical cases from UV to visible and NIR wavelengths. Application areas include photodynamic therapy (PDT) for cancer treatment and disinfection, pain relief, soft tissue surgery, dentistry, and ophthalmology. “To our knowledge this is the first laser of its kind to offer medical companies a significant time to market (TTM) reduction and reduced clinical trial costs. With ML7710 platform we can also support early phase research and development by offering researchers a flexible industrial product platform with a clear pathway to approvals and product launch. We are proud to have ML7710 already chosen by a handful of commercial companies and several leading medical centers in Europe and US as their medical laser platform. These customers have been very happy about our capability to offer full hardware solution with all required design documentation for product and clinical study approvals, not to mention the hands-on product support and services covering the whole lifecycle by our skilled application engineers”, says Mr. Sampsa Kuusiluoma, New Product Introduction Manager at Modulight. In addition to lasers themselves Modulight provides a full range of services for the whole lifecycle of the product. Modulight services include providing all regulatory device documentation, simple annual calibration, holistic total cost of ownership (TCO) optimization, and replacement and recycling. Modulight also helps their customers with the overall system configuration, e.g. how does the laser fit as a part of the whole treatment process and other surrounding instruments. Dr. Petteri Uusimaa, CEO of Modulight says: ”We’re extremely thrilled to have our ML7710 laser platform certified, to smooth out the way to market for all our customers. This is a key milestone in the execution of our strategy to offer optical solutions including related service products. To celebrate this and good improvement in our fiscal year profit we’ve agreed to launch a 2-month university discount program to demonstrate our commitment to support research and development in the field of laser medicine.